The name is of toponymic origin, denoting “one who came from Pulvertaft or Pulvertoft”, the name of a place in Lincolnshire under the Danelaw (Viking) which is today extinct. The earliest references traced, in England, are from the 1300s with the distribution largely in Lincolnshire, hence Pulvertoft Lane in Boston, with the highest population being in the 16th and 17th centuries. 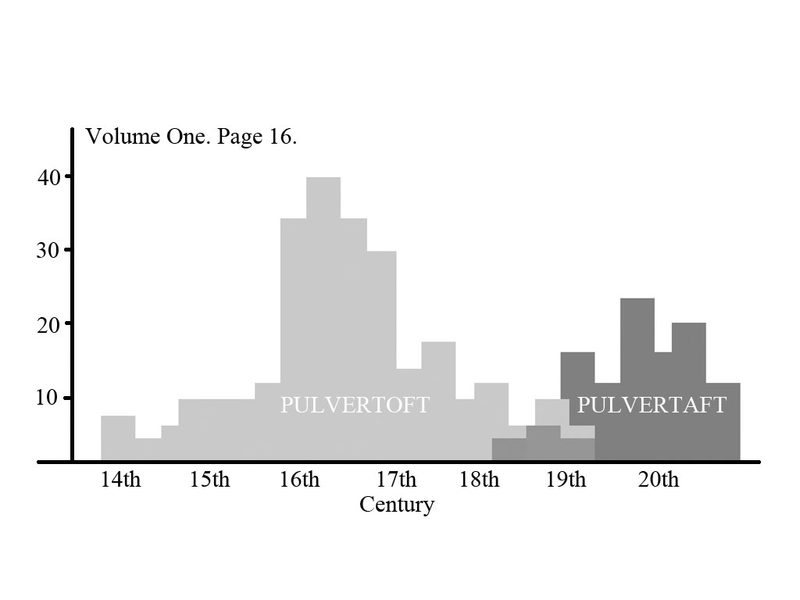 The toponym Pulvertaft is derived from Pulver, the name of a stream derived from the Old Norse “puldra” meaning “to gush”. As in Pulverbach, Shropshire. The suffix of the name “taft or toft” is derived from the Old Norse “topt” meaning “homestead” from Denmark and Scania as Toft(e). As in Lowerstoft, Suffolk. 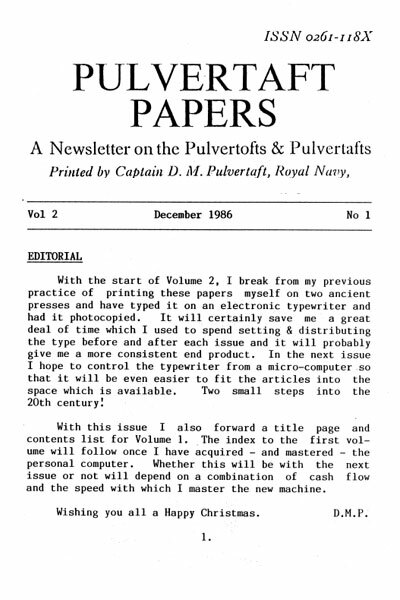 The purpose of this website is to preserve an online archive of the extensive material researched and compiled by David Pulvertaft rather than a celebration of the the name in itself (which could arguably mean Dustpot in German). These four volumes of searchable PDFs are thereby available to others researching family origins online. R. Guy Pulvertaft, C.B.E., M.A., Hon. M.D., M. Chir., F.R.C.S. 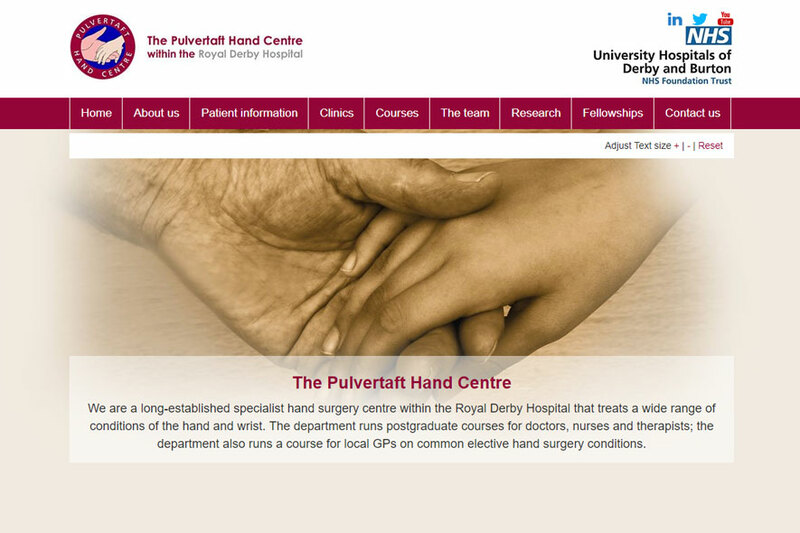 The department is named after Guy Pulvertaft (1907-1986) who was an internationally renowned surgeon at the Derbyshire Royal Infirmary from 1947 until his retirement in 1972. His interest in hand surgery was developed following a period of work in Grimsby where dock workers often received hand injuries followed by work during the II World War with the Royal Air Force. 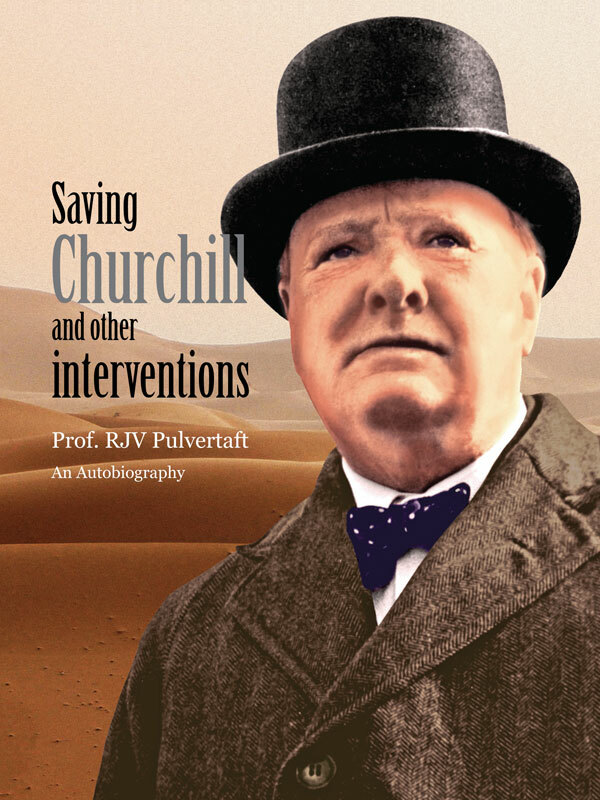 The previously unpublished memoirs of an Irish airman, lepidopterist and pathologist who went to war (twice) had a fight with Hermann Göring and then saved Winston Churchill from almost certain death without anyone noticing. About Sarah. I graduated from Sydney College of The Arts in 1988 and set up my first workshop in London in 1995. I use traditional techniques to make silver and gold jewellery in my Oxfordshire workshop. 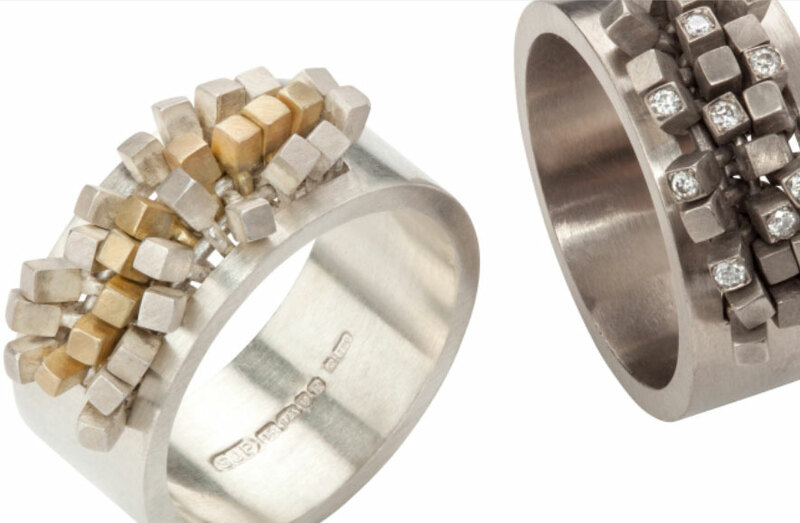 I like to combine repeated and kinetic elements to create subtle undulating surfaces and patterns in my pieces. Inspiration comes from many different sources including the rural environment where I live and work. I exhibit widely at shows and exhibitions in the UK and overseas. You can find a list of past, present and future events and a stockist list on my News and Events page. 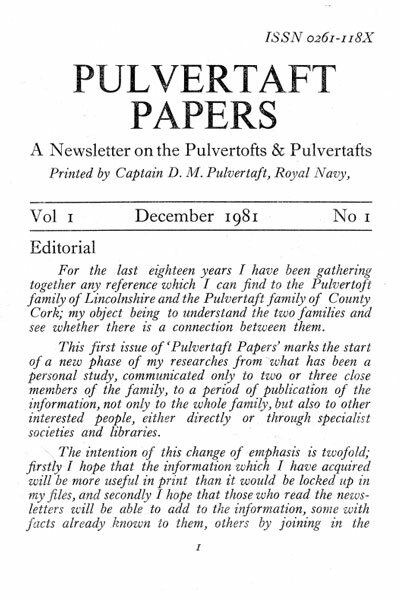 “Your letter has been forwarded to me as the current doyen of the Pulvertaft clan. It appears that Pulvertaft hunting is a national, even international sport, as few years go by without some enthusiast discovering, with delight, that like the coelacanth we are not extinct. I think the reason is that it is one of the very few pre Norman Conquest surnames still in use. 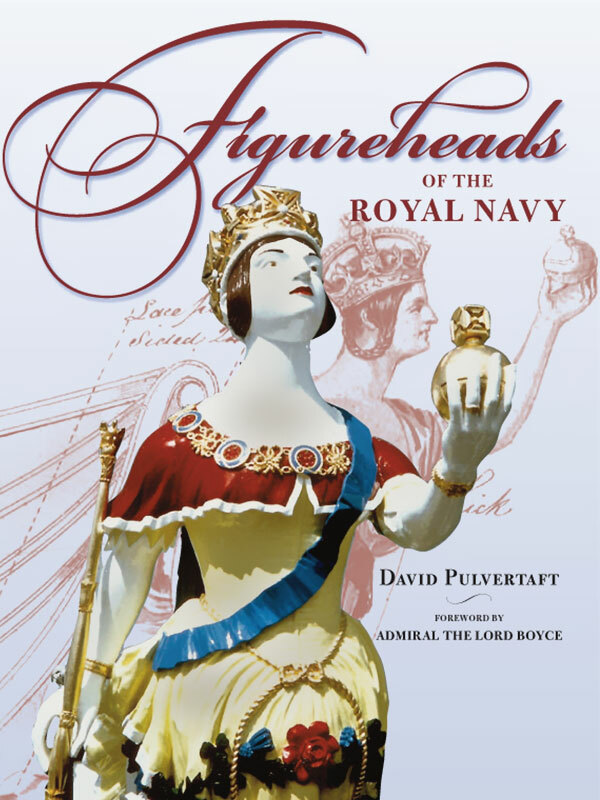 The family lived from time immemorial in East Anglia, Boston has a Pulvertoft Lane and Lincolnshire has a Pulvertoft Hall, no longer in the family. Here follows information handed down verbally. In the “Visitations” countless Pulvertofts appear. There are two grants of arms to members of the family. A number of the periodical “The Antiquarian” some 50 years ago was devoted to the family records. I do not bear arms whether qualified or not. The recent family history begins with Cromwell who hanged a Pulvertoft for burning a church; he was a Leveller. Cromwell established a battalion of Levellers among them at least one Pulvertoft who was sent to Ulster and fought at the Battle of the Boyne. During a post-Cromwell settlement, a piece of land known now as Castle Hackett in Co Cork was granted to my ancestor, who lost it at cards to a Hackett. I examined at medical finals with the contemporary Hackett (now in Australia). He would not give me back my land! 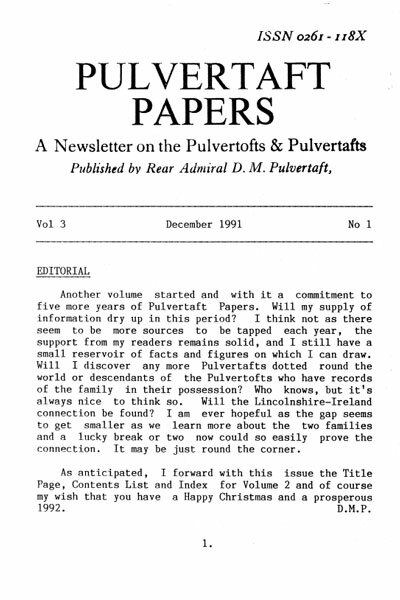 The Pulvertaft Papers. Volumes 1 to 4. 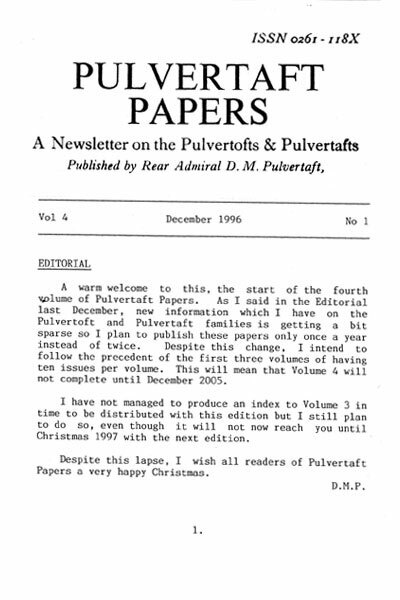 The following is a full collection of PDFs from the original hard copy editions in four volumes from 1981 to 2005. In May 2007. The site archive was fully completed with considerable thanks to Charles Scawthorn and his team.